I’ve had a very busy fall, and 2015 is going to be a very busy year. So I thought it was time to share some updates. First, it’s official – Darkest Misery (Miss Misery 4) is releasing August 25, 2015. Also, Misery Loves Company (Miss Misery 3) is releasing January 27th. And Wicked Misery (book 1) is now out in print. Revive, the first book in my new romantic NA sci fi series is releasing May 19th, and the cover reveal will be December 3rd. If you’re a book blogger who wants to participate in the reveal, you can sign up at Xpresso book tours. Finally, Another Little Piece of My Heart is coming up on its one year book birthday. 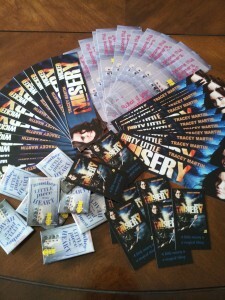 To celebrate that, and Wicked Misery’s paperback release, I want to shower everyone with swag. Want a signed bookmark for either one? Just email me! Also, as many people know, I’ve been dealing with some serious health issues since May. On one hand, throwing myself into writing has helped me deal with the stress. On the other, dealing with doctor visits and the side effects of strong medications can be very time consuming.While 2015 is going to be a busy year for book releases, my next books might take a little longer. But Jess’s story will wrap up in Miss Misery 5, and the cast of Revive will be getting a sequel. Just not perhaps as fast as I’d like. Ever wonder what would happen if Terminator and Alias had a NA book baby? Okay, you probably haven’t, but I’ve answered the question anyway because obviously I did. I’m super excited to announce that I sold my NA romantic sci fi, Revive, to Samhain! Revive will be coming out next year, the first in a new series (called RedZone). The only clue to her past is the fellow student who finds her. Although Sophia is certain he’s lying when he claims he can’t help her, his touch makes her heart race. Is it a result of how hot he is? Or a memory of how dangerous? As two men chase them from the station, Sophia’s memories return in frustrating fragments. Unknown to her, if she can’t figure it out in the next forty-eight hours, someone she loves is going to die. Because not only isn’t she a normal college student, she isn’t a normal human at all. Since I never officially said, “Hey, I’m going to be at RT in New Orleans this year,” (probably because I assumed no one would actually care), let me take a moment to say it now. Hey, I’m going to be at RT in New Orleans this year! So there’s that. I’ll be signing stuff and pretending I’m not totally socially awkward at the Giant Book Fair on Saturday afternoon, and then planning on stopping by the Teen Day Party that evening (where I will have to pretend even harder). If you’ll be there, please stop by and say hi so I don’t feel like the loser who no one wants to talk to. Oh, who am I kidding, I’ll be that person anyway. But if you talk to me, I’ll love you forever for trying. Also, I’ll give you stuff – signed bookmarks for Wicked Misery, Dirty Little Misery, and Another Little Piece of My Heart, plus Wicked Misery magnets and ALPoMH buttons. I’ll see you there, I hope. I’ve planned out five books in the series, so this is the middle one, AKA the book that turns Jess and Lucen’s worlds upside down. Can’t wait to share it! The scene takes place several hours after Wicked Misery ends. Hope people enjoy it! You can add it to Goodreads, or get it at Amazon, Amazon UK, or Smashwords. Several people have mentioned wanting to see the scene where Jess and Lucen finally get together. Well, ask and you shall receive. I didn’t think the scene fit in Wicked Misery (I’m not a fan of endings that drag on), but I totally get that people want their smexy times. So it’s written. It has a cover. I just need time to revise it and put it online. I hope it’s worth the wait, for your sake and Jess and Lucen’s. Starting November 29th, find each song on Claire’s playlist to be entered into a chance to win some awesome books from Harlequin TEEN plus Another Little Piece of My Heart swag! And if you find all 12? One grand prize winner will be entered into a drawing to win a $25 iTunes gift card plus more books and swag! Complete rules and details coming Friday! What better way to celebrate Wicked Misery’s release week than by signing the contract for the sequel? Dirty Little Misery (Miss Misery #2) is tentatively scheduled for summer 2014! So what’s in store for Jess? Gryphon shenanigans, magical drugs, secret societies, and–of course–a whole lot of Lucen. Can’t wait to share it!